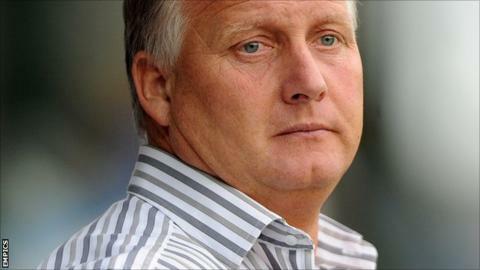 Kevin Blackwell admitted his side had their share of fortune as Bury won in League One for the first time this season against Hartlepool on Tuesday. although they had Pools defender Neil Austin to thank for their first league win under Blackwell. Bury moved off the foot of the table after Austin's penalty struck the bar. "Maybe that's a little change of luck, but the players have earned that change of luck," Shakers boss Blackwell told BBC Radio Manchester. "David Worrall's shot [for the second Bury goal] went in off the post. Up until this point, it's been going out off the post. "It was a big night and hopefully one or two things have turned. "I know we've been very close [to a win] since I've been here. I knew we'd win a game sooner rather than later, but it's nice to win." Bury have taken five points from their six league matches and remain five points from safety.